Alex's parents arrived on Friday for a visit. They are going to be here for a few days before they go to Berlin and eventually Rome with us, but Alex has to work this week so our family outings needed to be accomplished over the weekend. I wanted to visit someplace that was new to everyone, and Alex's dad had heard good things about Bruges, Belgium, and when we conducted a search of it on some social media travel pages, fellow military families raved about the place. Unfortunately, Bruges is 3.5 hours away from where we live, and Alex and I didn't have a dog sitter to watch Buster overnight. So, we were forced to look at places a little closer to home. 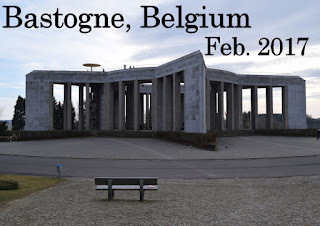 Brussels was an option, but Alex stumbled upon the city of Bastogne during his research and the person talking about it was selling the city, hard. He threw the idea out to his parents, and since the location had a historical significance, Alex's dad seemed okay with going there. My mother in-law didn't really care where we went, so long as we were spending time together as a family. I just wanted some more Belgiun chocolate. We arrived in the city midmorning and had a heck of a time finding parking. Our GPS claimed there was public parking near the city's center, but what it failed to know was that there was a street market happening in its location. No parking for us there. We drove around for a bit and finally landed two empty spots (we had to take two vehicles) on a side street with a grassy area we could pull onto. 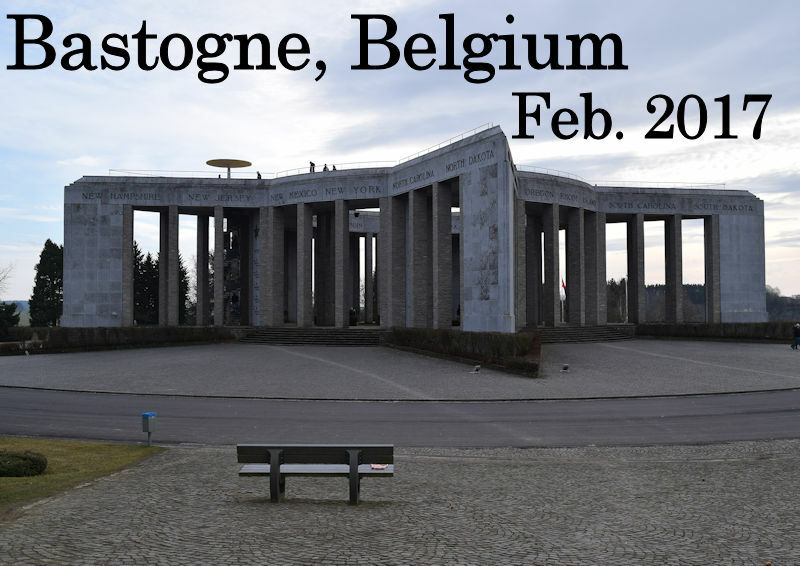 It was a lot chillier in Bastogne than any of us expected. When we had left home the weather was in the 40's, so Alex and I just grabbed our coats and left our gloves and scarves at the house. Fortunately, Evie had a spare hat in the car we could put on her. Hooray for the kids not listening and forgetting to grab their stuff from the car! We walked through the aforementioned market but didn't linger long. Alex needed a restroom and unlike Germany, where there's usually a wash closet attached to a parking garage, we needed to hunt for a place he could go. Our group ended up walking down to what I can only assume was the city center, stopping here and there to peek inside a sausage shop or look at the pretty restaurants. One was an old train car, which I thought was pretty cute. Eventually, we found an information building and downstairs was a restroom. So we got that taken care of and then went inside to find out where one of our points of interests was located. Right next to the building was an old tank memorial, which was interesting. "This tank, knocked out in December 1944, recalls the sacrifice of all the fighters for the liberation of Bastogne and Belgium"
Alex and his dad figured out where we needed to go and since it was a drive away, we decided to grab some food beforehand. That is always and probably will always be our kid's first priority. "That was first breakfast, what about second breakfast?" Even though we were in the city's center none of the restaurants sounded appealing to us. All the menus posted outside were ridiculously expensive. Pizzas were almost 20 Euros apiece and fondues were 30. Personally, I did not want Italian because we are less than two weeks away from our Rome trip. Actually, this time next week we will arrive! So it seemed kind of foolish to eat lasagne in Belgium when we were about to be in the motherland. In the end, all of us began strolling back in the direction we had come, hoping a place would pop out to us. As we walked, we passed by this shop selling rotisserie chickens and the displays they had in the window looked good. I took a closer gander and saw they had chicken strips. Which meant it passed the kid-friendly test, and folks were streaming into the building. The line was almost out the door. Clearly, this place was popular. Before we went in to get some food, my mother in-law spotted a chocolate shop (called Leonidas) and went in for a look. The chocolate inside was reasonably priced; it was 6 euros for a 250g box and that amounted to 16 truffles. The biggest issue was that nobody in the shop spoke English well, so Alex had to pick the items blindly. To a certain degree, I've gotten spoiled with the larger cities and/or nearby towns. The majority of workers and residents have a basic handle on English due to the sheer number of us living over here, so I tend to get by fairly well when needed. In Bastogne, though, there was a big language barrier. And I guess I didn't think we were being imposing enough, because as we were getting ready to leave the shop I knocked over a huge window display with my backpack. Way to make us Americans look good. If Landon's not having a complete meltdown in public or Evie isn't dropping food off tables then I'm whacking stuff off shelves with my bag. After all of us kind of ran out of the shop, (Alex stayed to help clean up) everyone went in to get chicken except for Evie and me. We stayed out on the street to not clog up the line any more than necessary. The deciding factor in picking La Plaza was the rotisserie chicken, but when Alex went to place his order they told him the next batch wouldn't be finished for another fifteen minutes. Nobody wanted to wait that long, so the parents got a pork sausage and Alex got a chicken sausage. All of us also split an order of roasted potatoes and almond covered mashed potatoes. We took the food back to the car and drove to our next point of interest. I figured there would be some benches and open spaces for us to eat the food. And if it hadn't been so windy the meal would have been very relaxed and enjoyable. The chicken strips Landon had were decent, but the sauce they put on my sandwich was some nasty stuff. And the sausages were sweet. They had raisins in them. It was not our best experience with new dishes. It was 14 Euro for adults and free for children under 6 years old, and an audio guide was provided in English for each person. Landon took my headset, and in turn Alex and I discovered a great way to keep him entertained in museums. He listened to each passage and stared at the displays and remained very well behaved. From now on, any time we want to visit a museum, we're going to places that offer an audio guide! Evie, on the other hand, did not do well. The museum consisted of three floors, three short films, and an outside viewing area, but Evie wasn't past the first room before she had had enough. The little girl had one massive meltdown that effectively ended Alex and I's exploration. From the little we did see, though, the place seemed interesting. Aside from the toddler fiasco, it was a nice Saturday outing. I love the fact that my little family lives in Germany and when relatives come to visit, we can hop around to different and amazing places. I feel like, in a way, that makes up for them having to travel so far to see us. They might have to endure an 8 hour flight across the Atlantic, but at least we'll welcome them with German beer and Belgium chocolate. There's a whole ton of worse places we could be living right now. I appreciated my in-laws accommodating us and going somewhere they might not necessarily have wanted to see right away; I just wish I could have explored more of the museum. On our way out, though, Alex spotted a 10K bike path that could covered a lot more of the outside exhibits and we made a mental note to maybe return during the summertime to give that a try.